The chief of the Russian Air Defense Forces General Staff has spoken about the country's nuclear and naval capabilities, as well the military campaign in Syria. Valery Gerasimov, the chief of Russian General Staff has told the board of the Russian Defense Ministry that the country's strategic nuclear forces are currently capable of inflicting unacceptable damage upon any aggressor, including those possessing anti-missile weapons. "In total, the share of modern weapons in the ground, air and sea strategic nuclear forces has been brought up to 74%," Gerasimov added. According to the chief of the Russian General Staff, the combat capabilities of the aviation strategic nuclear forces have increased by one and a half times over five years. "The number of aircraft capable of using new cruise missiles has increased more than 11 times, the share of modern strategic missile carriers has increased by 53% compared to 2012 and amounted to 75.7%." Gerasimov noted that during this period the spacecraft of the Unified Space System had been launched, which "gave the opportunity to increase monitoring of ballistic missile launch sites on the Northern America’s mainland and areas of foreign countries’ submarines patrols." "Over the five years we have secured building up of the orbital group, 55 military spacecraft have been launched, a new Angara rocket complex, which allows to place payloads in all types of Earth orbits from the territory of the Russian Federation, has been developed. The further development of the system will enable continuous global monitoring of ballistic missile launch sites." According to the chief of the General Staff, Russia had also managed to improve its missile attack warning system in recent years. "Within the framework of the development of the Russian Aerospace Forces the improvement of the missile warning system has become one of the priorities," Gerasimov indicated. He pointed out that Russia had bridged the gaps between the radar fields of the northern and southern parts of the country, adding that aerospace defense has been put on a qualitatively new level. "It [aerospace defense] is based on the Russian Aerospace Forces, created in 2015 as a result of the merger of the Russian Air Force and the Russian Cosmic Defense Forces. Thus, shared responsibility for the organization of aerospace defense, the organization and development of troops engaged in fighting in this field, their training and use, has been established," Gerasimov said. Commenting on the Russian military operation in Syria, Gerasimov has shed light on the number of liberated populated areas. "More than 1,000 settlements have been liberated and more than 54,000 militants from the armed gangs (including 2,800 Russian nationals and 1,400 people from the CIS states) have been killed [in two years]." Militants in Syria have been well-equipped and prepared, Gerasimov added. "[They] had no shortage of munitions and funds that have been constantly replenished from abroad… Their commanders have been trained in special camps under the direction of western combat instructors, the advisers from the Middle East, Western Europe and from American countries have been working in such camps. In several cases, the officers of these states' special forces units had been heading illegal armed gangs." According to him, all the commanders of the military districts of the Russian army have acquired combat experience in the war-torn Arab Republic. "Practically all the flight personnel of the operational-tactical and army aviation have acquired experience of conducting combat operations. Many of them showed themselves to be real air aces." He went on to say that Russian troops are developing methods of destroying enemy targets based on the experience gained in Syria. "The experience gained in Syria has prompted the development and practice of new forms of using the Russian Armed Forces, as well as methods of conducting operations and warfare… The large-scale use of high-precision weapons has become an element of all the operations." 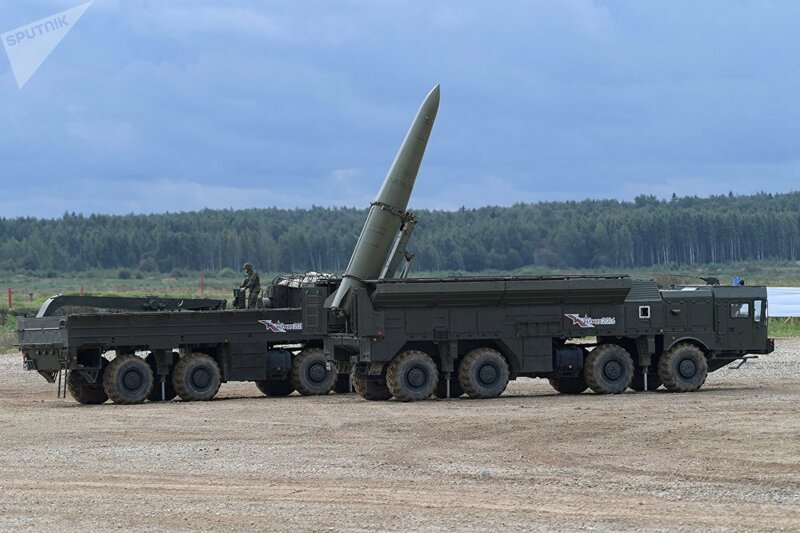 According to the official, in the past five years serial supplies of Iskander-M short-range ballistic missile systems and submarine and surface ships with Kaliber missile systems were established, while the modernization of planes for the use of Х-101 cruise missile began. "As a result, the number of ground, naval and aerial carriers increased more than twelve-fold, while those of high-precision cruise missiles [increased] more than thirty-fold," he said. Four missile brigades of the Eastern Military District are equipped with Iskander-M complexes, according to Valery Gerasimov. "As part of the Eastern Military District formed the army corps, missile, artillery, anti-aircraft missile brigade, as well as a brigade of army aviation. The missile complexes of Iskander-M were delivered to four missile brigades of the district." The Iskander-M is considered to be one of the Russian newest weapons, introduced into the Russian military in 2006, with Moscow planning to equip all units of the country's ground forces with the systems by 2020. Gerasimov has also revealed that Russia is finalizing the development of drones which are able to function at a distance of 3,000 kilometers (almost 1,900 miles). "The development of promising systems able to carry out tasks at a distance of up to 3,000 kilometers is nearing completion." "The Strategic Missile Forces received more than 80 ballistic missiles. Twelve missile regiments were re-equipped with the new-generation Yars systems in five years," he added. The Russian Defense Ministry and the country's military-industrial complex are working to increase the combat capabilities of the naval component of Russia's Strategic Nuclear Forces, according to Gerasimov. "Work has begun on the creation of an atomic cruiser submarine with improved characteristics Borey-B," Gerasimov said. He underlined that Russia's navy currently expects five Borey-A submarines to be built by 2020.